QUIZMO is a fun handheld interactive quiz game that knows the answers to 693,135 questions. That's quite a bit. The unit will flash its lights and beep to tell players if their answers are right. Plus, it'll keep score - ahh, if only life had more impartial third party determinations. Great for travel and packed with educational value. 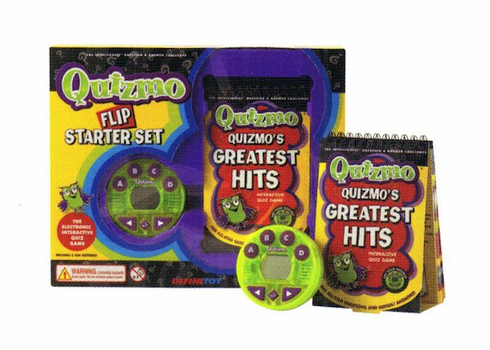 Features 1 QUIZMO unit and QUIZMO's Greatest Hits, with 400 all-new questions from the first five QUIZMO Flip Books.